Today’s Station on this day before Palm Sunday is at the Church of St. John’s Before The Latin Gate. Remember that St John the Apostle and Evangelist endured but did not succumb to martyrdom. Until Maundy Thursday, in masses of the season, the Psalm Judica me Psalm 42 is omitted as well as the Gloria Patri after the Introit and the Lavabo. 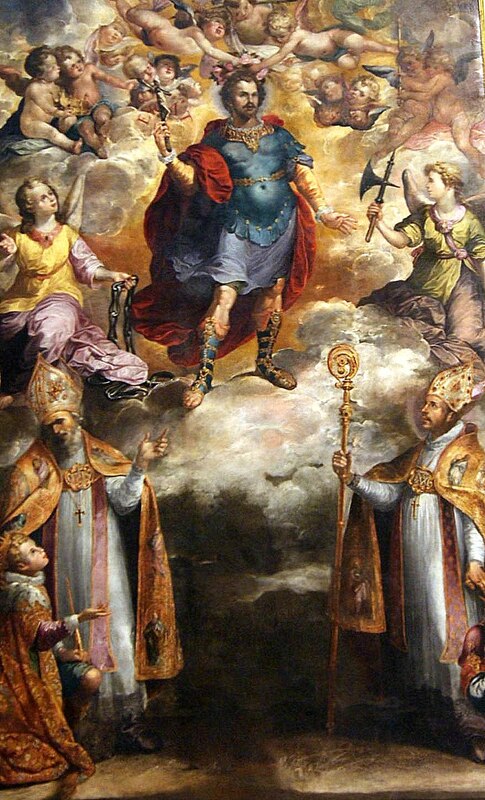 St. Hermenegild was a Visigoth Prince martyred for the faith in 585. He was put to death by his father, the Arian King Leovigild for holding firm to the Catholic faith. His father cast him into a dungeon and after several months, sent an Arian Bishop to him on Easter Sunday to offer him a pardon if he would accept Communion from him. By his firm refusal to yield his faith to heresy, even to his father’s heresy, he earned a martyr’s crown. His story has a particular relevance to this unique and tragic time in the Church. Modernism, the synthesis of all heresies is the current counterpart to the ancient evil of Arianism; and now under the grim assault of the contemporary zeitgeist, we are facing an even greater threat to the faith in the promotion of relativism and subjectivism. Unlike past times, today’s Church is not only beset by a pernicious heresy, it is permeated with a debilitating corruption in both the laity and the consecrated life. Now, the Church is so constituted that those who are blessed with the faith are charged with helping those who are failing in their faith. O God, Who didst teach thy blessed Martyr Hermenegild to choose an heavenly rather than an earthly crown, grant, we beseech thee, that we, like him, may so pass through things temporal that we finally miss not those which are eternal. Through Jesus Christ, thy Son our Lord, Who liveth and reigneth with thee, in the unity of the Holy Ghost, ever one God, world without end. R. Amen. As thou hast received our gifts and prayers, O Lord, cleanse us, we ask by thy heavenly mysteries, and graciously hear us. Through Jesus Christ, thy Son our Lord, Who liveth and reigneth with thee, in the unity of the Holy Ghost, ever one God, world without end. R. Amen. Grant, we pray, O Lord our God, that we who in time render joyful service in memory of thy saints, may be gladdened by their company in eternity. Through Jesus Christ, thy Son our Lord, Who liveth and reigneth with thee, in the unity of the Holy Ghost, ever one God, world without end. R. Amen. In that time, Jesus said to the people: If any man come to me, and hate not his father, and mother, and wife, and children, and brethren, and sisters, yea and his own life also, he cannot be my disciple. And whosoever doth not carry his cross and come after me, cannot be my disciple. For which of you having a mind to build a tower, doth not first sit down, and reckon the charges that are necessary, whether he have wherewithal to finish it: Lest, after he hath laid the foundation, and is not able to finish it, all that see it begin to mock him, Saying: This man began to build, and was not able to finish. Or what king, about to go to make war against another king, doth not first sit down, and think whether he be able, with ten thousand, to meet him that, with twenty thousand, cometh against him? Or else, whilst the other is yet afar off, sending an embassy, he desireth conditions of peace. So likewise every one of you that doth not renounce all that he possesseth, cannot be my disciple.